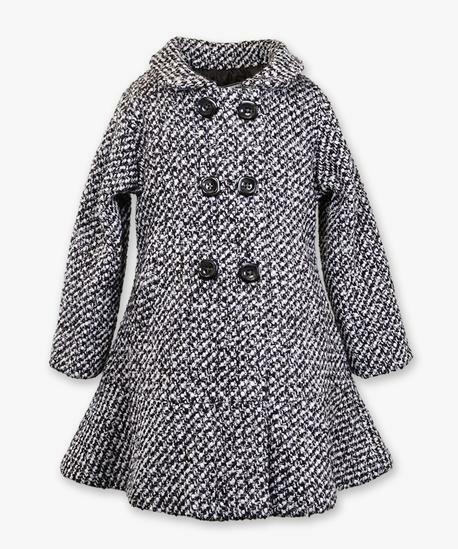 This classic styled double-breasted faux wool coat has a flared bottom to appeal to the young lady in your life. This sophisticated coat has an easy zipper and a snap close for a stress-free dressing experience. 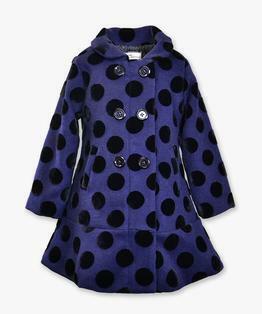 This Machine Washable coat allows for care-free wear. Welt Pockets. 75% Polyester 25% wool with 100% Polyester lining. Zip and Snap closure. Textured Tweed Coffee with Chocolate Brown Taffeta Lining quilted with light batting on the body portion. 6 ornamental brown buttons with snap close. Available in sizes 2-12. Hand Wash cold with detergent. Imported.